William Adams (born March 15, 1975), known professionally as will.i.am (pronounced "Will I am"), is an American rapper, singer, songwriter, DJ, record producer, voice actor and philanthropist, best known as a founding and lead member of the hip hop group The Black Eyed Peas. As a solo artist, will.i.am has released four solo albums, beginning with Lost Change, released in 2001 through Atlantic Records. His second solo outing, Must B 21, was released on September 23, 2003. The track "Go!" was regularly used as the theme for the NBA Live 2005 and Madden NFL 2005 seasons. The third album, Songs About Girls, was released on September 25, 2007. He released his fourth studio album, #willpower, in 2013. As a music producer, will.i.am has produced with other artists including Michael Jackson, Justin Bieber, Kesha, Britney Spears, Miley Cyrus, David Guetta, U2, Rihanna, Cheryl, Lady Gaga, Usher, Justin Timberlake, A. R. Rahman, Nicki Minaj, 2NE1, and Baby Kaely. In collaborations and with the Black Eyed Peas, he has a total of 41 top-40 entries on the UK Singles Chart since 1998, and has sold 9.4 million singles in the UK. William James Adams Jr.[note 1] was born in Eastside Los Angeles, and was raised in the Estrada Courts housing projects in the Boyle Heights neighborhood, where he and his family were among the few African Americans living in a predominantly Hispanic community. Adams has never met his father, William Adams Sr. He was raised by his mother, Debra (née Cain), who encouraged him to be unique and to avoid conforming to the tendencies of the other youths in his neighborhood on the east side of Los Angeles. To encourage his musical career, she sent him to public schools in affluent West Los Angeles. While attending John Marshall High School, he became best friends with Allan Pineda (stage name apl.de.ap), who was also a future member of The Black Eyed Peas. While still in high school, Adams and Pineda performed in East L.A. clubs and were soon joined by three other entertainers to form the socially conscious rap group, Atban Klann. Atban Klann caught the eye of Compton rapper Eazy-E and was signed to his label, Ruthless Records in 1992. Adams used to attend raves while in high school. He later said his history with rave culture is why he chose a more electro sound for The Black Eyed Peas' albums The E.N.D. and The Beginning. Despite the use of electro and house music elements, will.i.am prefers to separate the underground from pop. In an article with Los Angeles Times, he mentions that secrecy over the whereabouts of raves is what made raving special, and different from the mainstream. In the summer of 1988 will.i.am began his music career when, as an eighth-grader, he met up with fellow rapper Allan Pineda (apl.de.ap) and fellow student Dante Santiago. They began performing together around Los Angeles and were soon discovered by rapper/entrepreneur Eazy-E, who signed them to his label Ruthless Records in 1992. At the time, Will was known as "Will 1X". Atban Klann's first ever official track, "Merry Muthafuckin' Xmas", was included on Eazy-E's EP 5150: Home 4 tha Sick. After this, the trio began recording an album, "Grass Roots", with the help of producers Mookie Mook and DJ Motiv8, but the album was never released due to Eazy-E's death in 1995. After Eazy's tragic death, they changed their name to Black Eyed Pods, and Will replaced Dante with Jaime Gomez, better known under his stage name of Taboo. In 1997, they once again changed their name, this time to The Black Eyed Peas, and began recording their first album, Behind the Front, with the help of soul singer Kim Hill. They were soon signed to Interscope Records, and released their debut single, "Joints & Jam", in early 1998. The album was successful enough for the group's contract to be renewed, and in 2000, a second album, Bridging the Gap, was released. Following the release of Bridging the Gap, Will began recording his first solo release, Lost Change, which was the official soundtrack to the film of the same name. Featuring collaborations with Medusa, Planet Asia and Terry Dexter, the album was a critical success. In November 2001, work began on a third Black Eyed Peas album, Elephunk. Development of the album began on November 2, 2001 and was released just under two years later in 2003. At the time of development, only will.i.am, apl.de.ap and Taboo were to feature on the album. During the production of "Shut Up" (the second single released from the album), they realized that a female vocal would work well with the song. Originally, Nicole Scherzinger (lead singer of The Pussycat Dolls) was approached to make a guest appearance on the record. She was forced to decline because she already was signed to a contract with Eden's Crush. Danté Santiago then introduced Fergie to will.i.am, who was impressed with her vocal talents. She immediately formed a bond with the band and became a permanent member of the Peas and her photo was printed onto the album cover. Nine out of the fourteen tracks were composed by lyricist Robbie Fisher, who has been working closely with the band since the beginning stages of the album. In the United States, Elephunk reached number 14 on the Billboard Top 200 and is their first album to chart in the top 15. It gained even more commercial success in the UK Album Charts where it reached number 3. It has sold over 1.6 million copies in the UK and 8.5 million copies worldwide. The singles "Where Is the Love?" and "Shut Up" reached number 1. "Hey Mama" has been used for several advertisements including advertisements for Apple and iTunes. "Let's Get It Started" also received universal acclaim in the media section where a cover version of the song appears in the film Hot Tub Time Machine. After the success of Elephunk, the Peas were approached by EA games to feature some of their music on the 2004 game The Urbz. They remixed some of the tracks on Elephunk and translated it into Simlish and created new tracks for the game. They also feature in the game as playable characters. The group released their breakthrough single, "Where Is The Love", in November 2002 (featuring Justin Timberlake, although he did not appear in the video). On the strength of that single and follow-up singles like "Shut Up", Elephunk went on to sell 8.5 million copies worldwide. During this time, Will recorded a second solo album, Must B 21. In 2002, Will recorded the song "Secrets" for the soundtrack to Dexter's Laboratory: The Hip-Hop Experiment, a musical accompaniment to the Cartoon Network original series. Prior to this, he had also composed the theme music for another Genndy Tartakovsky series, Samurai Jack. In November 2003, work began on a fourth Black Eyed Peas album, entitled Monkey Business, the second album with new band member Fergie. Upon the success of Monkey Business, which was released in 2005, the album was certified three times Platinum by the RIAA in the U.S. and has sold over 10 million copies worldwide. The Canadian Recording Industry Association (or CRIA) has certified Monkey Business 6x Platinum, with sales of over 600,000 copies. The Australian Recording Industry Association (or ARIA) has also certified Monkey Business 6x Platinum, denoting sales of over 420,000 copies. The album's tracks earned the group four 2006 Grammy Award nominations and they also won the Grammy for Best Rap Performance by a Duo or Group for "Don't Phunk with My Heart". According to IFPI, over 2 million copies have been sold in Europe. In the UK alone, it has sold over 1 million copies, although this is significantly lower than their sales of Elephunk, which stand at over 1.6 million copies and 10 million worldwide. the band announced they were going to take a break to focus on their own personal projects. Will went on to produce Ferguson's first solo album, The Dutchess, which was released in 2006, before beginning work with Michael Jackson, who had requested Will's expertise for the recording and production of his new album. Work began on the Jackson album in 2006, and continued until the singer's death in 2009, at which point will.i.am revealed that none of the material recorded during the period would be released. However, remixes recorded for Jackson's Thriller 25 anniversary album were released in 2008. In 2007, will.i.am announced that he had co-created an all-female soul band entitled the Paradiso Girls, who he intended to work with on an upcoming solo project. The album, Songs About Girls, was released in 2007. The album spawned three singles, "I Got It From My Mama", "One More Chance" and "Heartbreaker", and fared slightly better than his previous solo efforts, however, failed to shift more than 75,000 copies. Will also did a remix to the song With Love by actress and singer Hilary Duff. In 2008, will.i.am contributed the song "One Tribe" to the Survival International charity album, Songs for Survival. Also in 2008, he was featured on rapper Flo Rida's debut album, Mail on Sunday, where he produced and featured on the song "In the Ayer", and featured on Usher's fifth album, Here I Stand. In January 2008, will.i.am announced plans that he was masterminding a political album, Change is Now: Renewing America's Promise, in support of Barack Obama's presidential campaign. The first single, "Yes We Can", featured a music video directed by Jesse Dylan. The lyrics of the song are composed almost entirely of excerpts from Obama's speech on January 8, 2008, following the New Hampshire presidential primary election. The video features appearances from numerous celebrities including Scarlett Johansson, Tatyana Ali, John Legend, Herbie Hancock, Kate Walsh, Kareem Abdul-Jabbar, Adam Rodríguez, Kelly Hu, Hill Harper, Amber Valletta, Eric Balfour, Aisha Tyler, Nicole Scherzinger, Nick Cannon, Bryan Greenberg, and Common and first appeared on the website for Dipdive. The video racked up three million views within a week and over four million subsequently on YouTube. On June 13, 2008, "Yes We Can" won an award at the 35th Annual Creative Arts and Entertainment Daytime Emmy Awards for "New Approaches in Daytime Entertainment". On February 29, 2008, the album's second single, "We Are the Ones", was released on Dipdive and YouTube. Including cameo appearances from Jessica Alba, Ryan Phillippe, Kerry Washington, pop punk band Yellowcard's front man, Ryan Key, John Leguizamo, Regina King, Tyrese Gibson, Eric Mabius, Tichina Arnold, Adrianne Palicki, comedian George Lopez, and singers Macy Gray, Zoe Kravitz and The Black Eyed Peas' Taboo, the video features everyone chanting "O-BA-MA" as a portrayal as their hopes and wishes for Barack Obama and his presidential campaign. On November 4, 2008, will.i.am spoke to CNN's Anderson Cooper about his support for then-Senator Obama using CNN's 'hologram' technology (actually tomography). Following the 2008 election, and Obama's victory, Will released the album's third single, "It's a New Day". The video reflects on the historical events that led to the election of the first African-American president and the public's reaction to his election. The video features celebrities such as Fergie, Olivia Wilde, Kanye West, Harold Perrineau, Kevin Bacon, and his wife Kyra Sedgwick. The video debuted on The Oprah Winfrey Show. In honor of the inauguration of Barack Obama as president, will.i.am collaborated with producer David Foster on the album's fourth single, "America's Song", with contributing vocals from Seal, Bono, Mary J. Blige, and Faith Hill. In response to Barack Obama's reaction following Kanye West's interruption of Taylor Swift at the 2009 MTV Video Music Awards, will.i.am penned the album's fifth and final single, "The Jackass Song". It featured a sample of Kanye West's "Heartless". Will wrote a blog post, which featured the song on Dipdive, and released in February 2009. will.i.am attended and spoke at the FIRST Robotics Competition kickoff on January 8, 2011, declaring, "I am a FIRST fan." He has also named FIRST Founder Dean Kamen "one of [his] heroes" on his verified Twitter account. In March 2009, will.i.am announced plans for The Black Eyed Peas to return, and within months, their comeback single, "Boom Boom Pow", had reached number 1 on the UK Singles Chart and Billboard Hot 100. They went on to have three number 1 singles before releasing their comeback album, The E.N.D. The album's success warranted a second comeback album, The Beginning, released in November 2010. The album spawned another three hit singles, but the band soon announced plans they were to break again, following the conclusion of their world tour. In 2009, will.i.am worked with rappers Flo Rida and Akon for Flo's second studio album, R.O.O.T.S., and recorded four tracks with Girls Aloud member Cheryl for her debut solo album 3 Words. He also worked with Rihanna on her fourth studio album, Rated R, for a track called "Photographs". In February 2010, he wrote and produced the single "OMG" by Usher, which appeared on Usher's seventh studio album, Raymond vs. Raymond. In a YouTube video posted by YGLifeOfficial on March 15, 2010, will.i.am expressed his desire to work with Korean K-pop girl group 2NE1, and help them achieve international success. Will has recorded a collaboration with Britney Spears, "Big Fat Bass", which features on her seventh studio album, Femme Fatale. During the recording of The Black Eyed Peas' sixth studio album, The Beginning, band colleague Fergie announced in an interview that will.i.am was in the process of recording a new solo album, tentatively entitled Black Einstein. will.i.am formally announced that he was in the process of recording a fourth solo album, with some material being recorded under the pseudonym Zuper Blahq. In January 2010, a cut from the album, "I'm In the House", a collaboration with Steve Aoki, was released as a single, charting at #29 on the UK Singles Chart due to strong downloads. In October 2010, a second cut from the album, "Check It Out", a collaboration with Trinidadian rapper Nicki Minaj, peaked at #4 on the UK Singles Chart. In February 2011, a third cut from the album, "Dance", a collaboration with Natalia Kills, peaked at #62 on the UK Singles Chart. The music video was directed by James Sutton, and features a cameo by Natalia. In April 2011, will.i.am recorded four songs for the soundtrack of the animated film Rio, in which he voiced a character. "Hot Wings (I Wanna Party)", "Drop It Low", "Real In Rio" and "Advice For The Young At Heart", featuring an array of artists including Jamie Foxx, Anne Hathaway and Tears for Fears. None of the songs managed to chart, however, Will announced that he was going to remix the tracks for inclusion on Black Einstein. In September 2011, a fourth cut from the album, "Forever", a collaboration with Wolfgang Gartner, was released as a single. It was around this time that will.i.am announced that he changed the title of the album from Black Einstein to #willpower. The video premiered on August 26, 2011. In November 2011, Will premiered what is intended to be the album's official lead single, "T.H.E. (The Hardest Ever)", a collaboration with Jennifer Lopez and Mick Jagger. Will announced via his Twitter that the video for "T.H.E. (The Hardest Ever)" was filmed in LA, and that before he returned home, he stopped off in Brazil to film the video for the album's second official single, "Great Times". In December 2011, a fifth cut from the album, "Party Like An Animal", a collaboration with Dutch singer Eva Simons & LMFAO, premiered at the HTC Beats Launch party. Will.i.am also announced he has collaborations with Britney Spears, Alicia Keys, Busta Rhymes, Swizz Beatz and a couple others on the album. He also stated there is a possibility Shakira could feature on the album. #willpower is due for release in 2013, and will.i.am later confirmed that Cheryl and Justin Bieber would also appear on #willpower. In mid-October, Britney Spears confirmed on her Twitter account that she had filmed the music video for the single she was featuring in called "Scream & Shout". He was among the performers at the Diamond Jubilee Concert held outside Buckingham Palace on June 4, 2012. The first song broadcast from Mars was his new single, "Reach for the Stars". He discussed and listened to it with a live audience at NASA in Pasadena, California after it was returned from the Curiosity rover. The song "Hall of Fame" by The Script also featured will.i.am. It debuted onto radio on July 23, 2012 and was released for digital download on August 21, 2012. He later featured in Priyanka Chopra's debut single "In My City". It was announced in October 2012 that will.i.am will feature on Kesha's second album Warrior on the track "Crazy Kids". He also co-wrote and co-produced the Dr Luke produced track. During an interview with Capital FM, will.i.am confirmed he had collaborated with Justin Bieber for his next release "#thatPOWER" and premiered the single on the same day it was released onto iTunes in the US the same day and debuted on the Billboard 100 at number 42. In April 2013, will.i.am and Chris Brown's track "Let's Go", also from the #willpower album, became the centre of a copyright controversy, with trance producers Arty and Mat Zo claiming that will.i.am used elements of their 2011 track "Rebound" in his song without permission from the artists or their label. This claim was later backed by Anjunabeats, the record label behind Arty and Mat Zo. His fourth studio album, #willpower, was re-released in December 2013 featuring several new tracks, including the lead single "Feelin' Myself" featuring Miley Cyrus, French Montana, and Wiz Khalifa. Britney Spears featured will.i.am on her song "It Should Be Easy" on her eighth studio album Britney Jean where he co-wrote and produced several tracks. He was also an executive producer of the project. On April 4, 2014, will.i.am appeared on Alan Carr: Chatty Man, where he talked about plans to release his own Smartwatch. He revealed that it can be used as a phone, to store music, and use Facebook, Twitter and Instagram. He also showed a preview of a music video for a song called "It's My Birthday". On May 20, 2014, a 90-second snippet was uploaded to SoundCloud. It features American singer-songwriter Cody Wise, is produced by Will and Damien LeRoy and is written by himself, Cody Wise and Keith Harris. It was released on July 6, 2014. In an interview with Capital FM, will.i.am confirmed that The Black Eyed Peas were getting back together. On April 7, 2016 will.i.am released the single "Boys & Girls" featuring Pia Mia. A week later on April 14, a new remix of "Mona Lisa Smile" featuring Nicole Scherzinger was released. 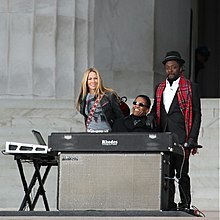 The Black Eyed Peas, including will.i.am, first started acting in the commercial series "Instant Def" to advertise Snickers. He starred in Madagascar: Escape 2 Africa as the voice of the character Moto Moto. He contributed a number of tracks to the movie's motion picture soundtrack in collaboration with industry heavyweight Hans Zimmer. Will.i.am played John Wraith in his major film debut, X-Men Origins: Wolverine, a prequel to the X-Men film series. He also guest starred on the CBS drama Joan of Arcadia as God, one of several actors who played this role during the series. He also starred in the 2011 animated film Rio, and 2014's Rio 2, as a rapping red-crested cardinal named Pedro, and like Madagascar: Escape 2 Africa, he contributed his singing voice to the film's soundtrack, along with his fellow co-stars. Will.i.am played a fathering role in The Urbz: Sims In The City, which uses The Black Eyed Peas' songs as its own soundtrack. He briefly played himself in the Tina Fey and Steve Carell comedy film Date Night. He appeared in the 2016 Grammy-nominated documentary film about American DJ and producer Steve Aoki, titled I'll Sleep When I'm Dead. On October 25, 2011, it was reported that will.i.am would be joining The Voice UK as a coach. A source said, "Will is 95 per cent a done deal. He is a big star and loves nurturing new talent. He shoots from the lip, and will not be afraid to tell it like it is. Although, I doubt The Voice will be as bitchy as The X Factor". will.i.am was later confirmed as a coach on The Voice UK, of this he said, "I'm proud to be doing The Voice UK because the UK was the first place I saw success," he said. "It's the place I'm the most creative outside of home." Cohen added, "I am thrilled that will.i.am has signed up to be a coach on The Voice. He is a huge star who will bring a unique creativity to the show." Talking about the differences between the show and X Factor, "I won’t be a judge on X Factor. The Voice is different. You can’t even compare the two. One, you have people in the music industry, current and legends, coaching the next generation. The other format you have judges critiquing, giving their opinions on things when they don’t really know, other than Randy Jackson on Idol". In preparation for the role as a coach, he asked advice from friend and ex-The X Factor judge Cheryl Cole. Talking to Capital FM he said, "I reached out to Cheryl for advice on keeping your cool, having a poker face, the importance of sticking with the singers – it's their dream, a lot of the times when you have other performers a part of the show, celebrities tend to want the shine so they hog up time. So my whole thing was that I want to do The Voice, but I don't want to hog up time to where the singers up there are looking like, 'Is this about you guys?'. In March 2012, it was reported that he had turned his "plush" dressing room into a recording studio, and "instead of just listening with his headphones, he has installed some mega bass bins". On November 26, 2013, will.i.am was announced as a coach for the 2014 series of the Australian version of The Voice along with fellow Voice UK judge Kylie Minogue. He was the winning coach having coached voice winner Anja Nissen in 2014. Neither will.i.am nor Minogue returned for the fourth series in 2015. He has contributed to The Voice UK since 2012. He also serves as a coach on the UK version of The Voice Kids. Before joining The Black Eyed Peas, will.i.am attended the Fashion Institute of Design & Merchandising in Los Angeles. In 2001, he began designing his own signature clothing line, i.am, which made its official debut in 2005 at the Magic Apparel Trade Show in Las Vegas. In 2007, will.i.am teamed up with Blue Holdings to design a premium denim collection, i.am Antik, that was scheduled to debut in August 2007 at the Project Show in Las Vegas. will.i.am instead had new partners and was launching i.am. Will.i.am is currently being sued $2 million for abandoning the project for which, the label states, he was obligated until 2016, but will.i.am insists it is already over. He also launched his own glasses range. Appearing at the kickoff event for the 2011 FIRST Robotics Competition, Logo Motion held at Southern New Hampshire University, will.i.am stated that he is "a big fan", and that the newly unveiled game was "dope". He also performed a concert for FIRST at the 2011 FIRST World Championship at the Edward Jones Dome. As part of a special concert for this 2011 FIRST Robotics Championships, will.i.am appeared with the Black Eyed Peas. It was recorded for a special aired by ABC on August 14, 2011 at 7 pm. He continues to support FIRST, and at the 2013 FIRST World Championship will.i.am became the first recipient of the Make It Loud award, which is given to the person who has contributed the most in increasing the awareness of FIRST to the general public. In January 2011, Intel Corp. named will.i.am as director of creative innovation, with input in developing smartphones, tablets and laptops. In January 2012, he appeared on the BBC TV series Top Gear, as the Star in a Reasonably Priced Car, where he claimed he was starting his own car company called IAMAUTO. By becoming the first artist to stream a song from the surface of Mars on August 28, 2012, will.i.am made inter-planetary music history. The event took place at 1 p.m. PDT (4 p.m. EDT) Tuesday, Aug. 28, at NASA's Jet Propulsion Laboratory (JPL) in Pasadena, Calif. Song title: Reaching for the Stars. Expanding his forays into iPhone accessory development, will.i.am has announced plans to release a camera enhancer that will "dramatically enhance the clarity and definition of iPhone photographs," by making the 8-megapixel sensor into an effectively 14-megapixel one. Termed the i.am+, the device is said to be the first in a series of "digital real estate" for the singer. In April, 2016 it was announced that i.am+ acquired Tel Aviv machine-learning technology start-up Sensiya. In 2016, The Verge reported that will.i.am would join actress Gwyneth Paltrow and serial entrepreneur Gary Vaynerchuk on Apple TV's Planet of the Apps, calling the trio "successful" and "big names" with experience launching companies. In the same year will.i.am was featured on the cover of Diversity In STEAM Magazine Spring 2016 issue. On July 27, 2017 i.am+ acquired Wink, the Internet of Things and Smart Home hub platform, from owner Flex for a reported $38.7 million with an additional $20 million commitment, likely earmarked to sustain manufacturing of Wink's products. The Institution of Engineering and Technology awarded will.i.am an Honorary Fellowship on November 15, 2017 for his outstanding contribution to the profession of engineering. In early 2018 will.i.am released his first book, Wizards And Robots, a collaboration with Brian David Johnson. According to an interview with the British tabloid The Sun, will.i.am says he suffers from tinnitus, a disorder common among musicians who have been exposed to loud music for prolonged periods. In April 2013, he stated that he has ADHD. As the nephew of former NFL player Lynn Cain, who played for the Atlanta Falcons and Los Angeles Rams, will.i.am spent a large part of his life looking up to his uncle as a role model. On June 22, 2009, gossip blogger Perez Hilton accused will.i.am and his entourage of assaulting him in Toronto after the MuchMusic Video Awards, a charge will.i.am denied in a video posted on his blog. No further action was taken. He is also a fan of Bayern München, a German football team, as he visited the Allianz Arena in Munich to watch one of their matches. He was also featured in one of Bayern’s videos on their YouTube channel. 2005 Joan of Arcadia Three Card Monte Guy God Episode: "Independence Day"
2007 Cane Himself Episode: "A New Legacy"
2019 The Rookie Episode: "The Checklist"
2008, New Approaches in Daytime Entertainment: "Yes We Can"
2011, Best Original Song: "What I Am"
2012, will.i.am. has won ten Television Rack Awards altogether (five with The Black Eyed Peas and five as a solo artist). ^ a b Although his legal name now is William Adams, the name on his birth certificate is William James Adams, which he only discovered when he was 25. ^ a b c 'will.i.am's Aha! Moment' Archived March 3, 2016, at the Wayback Machine (April 14, 2009) Oprah.com. Retrieved 2010-02-02. ^ "Baby Kaely". Youtube Channel. ^ "Official Charts Analysis: Linkin Park pip Maroon 5 to No.1 by 3k sales". Retrieved July 17, 2012. ^ "Media Centre - The Voice UK: will.i.am". BBC. June 1, 2013. Retrieved January 13, 2014. ^ McLean, Craig (May 30, 2009). "Force of Will". New Zealand Herald. Retrieved February 25, 2013. Aged 25, when a passport application resulted in him seeing his full birth certificate for the first time, he found out that his real, full name was William James Adams Jr. He was named after his Jamaican father he never known, and whom no one in his family ever discussed. ^ Dawson, Kim (February 15, 2011). "Brit awards 2011: plan b". The Daily Star. Retrieved October 7, 2012. The Black Eyed Peas frontman ... has William James Adams on his passport. ^ "Will.i.am explains airport anger about his real name". MSN. February 15, 2011. Archived from the original on May 30, 2013. Retrieved February 25, 2013. ^ Dennis, Steve; Taboo (2011). Fallin' Up: My Story. New York City: Simon & Schuster. p. 56. Retrieved February 18, 2012. ^ Will.i.am on Living in East Los Angeles - Exclusive Interview on NELA TV (Interview). Los Angeles, CA: egentertainment.net. February 17, 2011. ^ 'will.i.am of Black Eyed Peas Archived March 3, 2016, at the Wayback Machine (May 1, 2009) ChickenBones: A Journal. Retrieved 2010-02-02. ^ 'Nightline Playlist: will.i.am' Archived March 4, 2016, at the Wayback Machine (February 2, 2008) ABCnews/Frontline. Retrieved 2010-02-02. ^ Paul Scott (June 6, 2012). "Just who is will.i.am? From Olympic torch to Diamond Jubilee, how US star gatecrashed the celebrations". Mail Online. Retrieved April 14, 2013. ^ "The L.A. Times music blog | Will.i.am on Rave Culture: "The underground is bigger than the surface. That's what people don't understand."". latimesblogs.latimes.com. Retrieved February 7, 2016. ^ "Hot Tub Time Machine Interview". ^ "Black Eyed Peas To Feature In The Urbz: Sims In The City". Archived from the original on January 3, 2013. ^ "Big Builder - Home Building Industry News and Archive Information". Builder Online. February 3, 2012. Retrieved March 2, 2012. ^ "Songs for Survival – Survival International". Survivalinternational.org. Retrieved November 12, 2010. ^ Swift, Jacqui (October 17, 2008). "Bruce Parry says he owes the tribal people so much. Showbiz, Something For The Weekend". The Sun. London. Retrieved January 25, 2010. ^ "will.i.am's Yes We Can Song Video Awarded Emmy(R) for New Approaches in Daytime Entertainment". Reuters. June 16, 2008. Archived from the original on December 16, 2008. Retrieved January 25, 2010. ^ "Video – Breaking News Videos from". CNN. Retrieved January 25, 2010. ^ ""The Jackass Song" uploaded by will.i.am". Dipdive.com. Archived from the original on October 27, 2010. Retrieved November 12, 2010. ^ iamwill. "Blog written by will.i.am". Dipdive.com. Archived from the original on November 9, 2010. Retrieved November 12, 2010. ^ "FRC Kickoff 2011 Stream Recording". FRC Team 3403. January 8, 2011. Retrieved January 9, 2011. ^ will.i.am (January 8, 2011). "Tweet from @iamwill". ^ "". "Will.I.AM talks to 2NE1". YouTube. Retrieved November 12, 2010. ^ Navjosh (May 24, 2011). "Will.i.am To Release New Solo Album 'Black Einstein'. On October 24, 2011, songs were leaked through the internet after a presentation in club hosted by HTC. One of these songs is called "T.H.E (The Hardest Ever)" with vocals by Jennifer Lopez and Mick Jagger". Hip Hop N More. Retrieved September 21, 2011. ^ Wood, Beci (February 5, 2010). "Will.i.am is Zuper Blahq". The Sun. Retrieved September 21, 2011. ^ "Will.I.Am tweet about his new song "The Hardest Ever (T.H.E.)"". Twitter. October 12, 2011. ^ Mark Savage (February 22, 2012). "Cheryl Cole and Justin Bieber join will.i.am album". BBC News. ^ a b mars.nasa.gov. "Curiosity Rover Plays First Song Transmitted From Another Planet". mars.jpl.nasa.gov. Retrieved February 7, 2016. ^ Nyay Bhushan (August 25, 2012). "Priyanka Chopra's First Single to Debut on NFL's 'Thursday Night Kickoff'". Hollywood Reporter. Retrieved September 13, 2012. ^ Goodacre, Kate. "will.i.am and Chris Brown's 'Let's Go' in copyright breach allegation". Digital Spy. Retrieved April 17, 2013. ^ "Will.i.am Rips Off Arty & Mat Zo's 'Rebound' for Latest Single". TranceFixxed. April 17, 2013. Retrieved February 9, 2014. ^ "will.i.am : "Feeling Myself" feat. Miley Cyrus, Wiz Khalifa et French Montana en יcoute". Chartsinfrance.net. April 21, 2013. Retrieved January 13, 2014. ^ "Britney Spears On Working With Will.i.am: "He's Like A Kid Or A Little Genius!"". capitalfm.com. ^ "Britney Spears, 'Britney Jean': Track-By-Track Review". billboard.com. ^ "will.i.am on Chatty Man: New music and the watch". iam-fan.com. Archived from the original on October 5, 2014. ^ Celia Curtis (April 7, 2014). "What does will.i.am's smartwatch do?". The Telegraph. ^ "will.i.am Announces New Song 'Birthday' Featuring Cody Wise - Capital FM". capitalfm.com. ^ "WATCH: Will.i.am Confirms Black Eyed Peas Reunion… & Thinks They Should... - will.i.am - Capital FM". Capital FM. April 7, 2016. Retrieved April 10, 2016. ^ Ashleigh Rainbird (April 7, 2016). "Black Eyed Peas to reform five years after last album, Will.i.am reveals". mirror. Retrieved April 10, 2016. ^ "First episode of Instant Def". YouTube. March 15, 2010. Archived from the original on September 19, 2018. Retrieved November 12, 2010. ^ "Steve Aoki 'I'll Sleep When I'm Dead' Documentary Hits Netflix | The Nocturnal Times". www.thenocturnaltimes.com. Retrieved July 27, 2017. ^ Robertson, Colin; Thorogood, Tom (October 25, 2011). "Cheryl Cole's pal Will.i.am to be a mentor on The Voice". The Sun. News International. Retrieved January 31, 2012. ^ Jeffery, Morgan (December 2, 2011). "Jessie Black Eyed Peas' will.i.am confirmed as second coach on 'The Voice UK'". Digital Spy. Hearst Magazines UK. Retrieved January 31, 2012. ^ Tetteh, Sarah (January 27, 2012). "will.i.am on why Cheryl Cole won't work on X Factor again, his nights out with Mick Jagger and why The Voice is better than X Factor". Daily Mirror. Trinity Mirror. Retrieved January 31, 2012. ^ "Will.i.am asked for Cheryl's advice over 'The Voice' role". MTV. January 2, 2012. Retrieved February 2, 2012. ^ Deepika Rajani. "Will's awkward mistake on The Voice". OK! Magazine. Retrieved April 10, 2016. ^ "Black Eyed Peas' will.i.am Launches Clothing Line". Remixmag.com. Archived from the original on November 26, 2009. Retrieved November 12, 2010. ^ "will.i.am is now working with Specsavers - Ragtrader". ragtrader.com.au. ^ "cLOGO MOTION Game Revealed by Dean Kamen and will.i.am to 50,000 High-School Students at 2011 FIRST Robotics Competition Kickoff". Manchester: BusinessWire. January 8, 2010. Retrieved January 8, 2010. ^ "2013 FRC Championship Awards List". Retrieved June 2, 2013. ^ Olivarez-Giles, Nathan (January 25, 2011). "Will.i.am named Intel's director of creative innovation". Los Angeles Times. Retrieved May 6, 2012. ^ "NASA Joins Musician will.i.am, Discovery Education for Premiere of Song from Mars". Space Industry News. March 15, 1975. Archived from the original on March 1, 2013. Retrieved April 14, 2013. ^ Georgia Dehn. "Will.i.am's iPhone accessories to 'turn smartphones into genius phones'". The Daily Telegraph. Retrieved March 29, 2017. ^ Archibald Preuschat. "Deutsche Telekom Teams Up With will.i.am on New Smartwatch". WSJ. Retrieved April 10, 2016. ^ "Will.i.am's second wearable is a voice-activated smartwatch". Dezeen. Retrieved April 10, 2016. ^ Solon, Olivia (May 2, 2016). "Will.i.am's Back With a New AI That Lives on Your Wrist—Or in Your Clothes". Retrieved May 15, 2016. ^ "Apple's Planet of the Apps show will feature Will.i.am and Gwyneth Paltrow". The Verge. Retrieved March 9, 2017. ^ Lunden, Ingrid (July 27, 2017). "i.am+ buys Wink, the smart home hub formerly owned by Flex and Quirky". Retrieved August 3, 2017. ^ E&T editorial staff (November 15, 2017). "Will.i.am honoured by the IET for his 'outstanding contribution' to engineering". Retrieved November 15, 2017. ^ .i.am, will [@iamwill] (November 15, 2017). "When I was little willie in the ghetto & taking a 2hr bus ride to Brentwood Science Mangnet school, I never would have thought this was possible...but look what a early #stem education does...thank you mama, thank you @TheIET & thank you #BrentwoodScienceMagnetSchool" (Tweet). Retweeted by @theIET [Wikimedia] – via Twitter. ^ "Will.i.am pens futuristic YA novel for PRH Children's - The Bookseller". www.thebookseller.com. ^ Kaufman, Gil (December 7, 2010). "Will.I.Am Reveals He Has Tinnitus, Ringing In The Ears". MTV. Retrieved February 22, 2011. ^ "Black Eyed Peas | Will.i.am Has Adhd | Contactmusic.com". contactmusic.com. Retrieved February 7, 2016. ^ "Black Eyed Peas' Will.I.Am Wants To Try Out For The Dolphins". Newsroom.mtv.com. September 3, 2009. Archived from the original on October 27, 2009. Retrieved April 28, 2013. ^ "Perez Hilton Asks Twitter Followers to Call Police on will.i.am". Los Angeles Times. June 22, 2009. Retrieved June 16, 2015. ^ "daytime entertainment emmy awards creative arts, creative craft winners". Emmyonline.org. Archived from the original on January 11, 2010. Retrieved January 25, 2010. ^ "BlackEyedPeas.com – The Official Black Eyed Peas Website". Archived from the original on June 23, 2011. ^ "GRAMMY.com". GRAMMY.com. Archived from the original on December 4, 2008. Retrieved January 25, 2010. ^ "Nominations - Mirchi Music Award Hindi 2012". www.radiomirchi.com. Retrieved April 27, 2018. Wikimedia Commons has media related to Will.i.am.